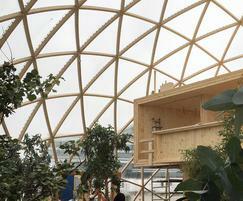 A huge transparent dome constructed with glue-laminated timber - the Dome of Visions - served as the Aarhus municipal pavilion during Danish city's time as the European Capital of Culture in 2017. As well as being an inspiration for new ways of building and living, the building also functioned as a modern community hall where conferences and debates on the sustainable cities and buildings of the future were held. The architect, Kristoffer Tejlgaard, focuses on sustainability and wanted to use wood as the main building material. He designed a grid construction for the dome and Kerto® LVL (Laminated Veneer Lumber) proved to be the optimal building material. 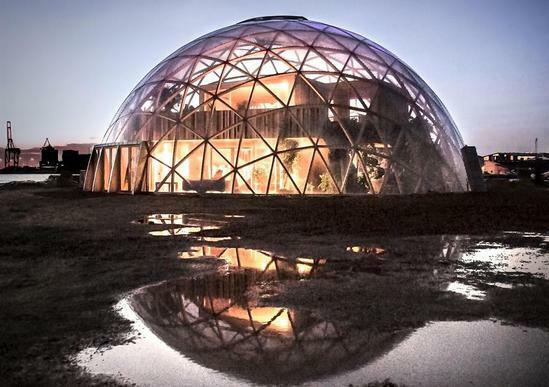 The dome is an improved version of two previous dome experiments - one used previously in Aarhus and Copenhagen, and the second used in Stockholm. 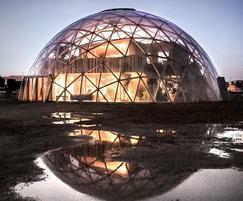 In this third version, the dome has grown to be 10.5m tall with a cross section of 24m, which forms a room of 450m2. It is about 100m2 larger than the first two versions. The facade of the dome is transparent, strong and built on a wooden grid of beams from sustainable and PEFC-certified Kerto® LVL (laminated veneer lumber), and assembled with invisible and embedded steel brackets. The grid construction of triangular shapes obtaind high strength and stability and rhombus-shaped sheets ensure high material utilisation and low waste of the polycarbonate plastic facade. The dome rests on six large pieces of curved glulam that form a circular platform. This platform rests on a screw foundation consisting of 2-3m deep screws divided into 46 points anchored in the ground, ensuring a solid foundation without extensive excavation work. Using curved wooden beams, the brackets for the dome's focal points were cut as stars in a 5mm steel plate. "With the custom-made Kerto beams it was possible to avoid complicated and costly welded brackets used in earlier versions of Dome of Vision," says Kristoffer Tejlgaard. "A challenge in this system was to mill curved slots for the steel brackets. The solution was to construct each bar from six layers of 21-millimeter Kerto LVL strips. Using a CNC milling machine it was possible to cut a slit for the brackets before the gluing process", Kristoffer Tejlgaard explains. The dome comprises a total of 588 curved beams, and with 186 different shapes, only a few beams are alike. Each beam consists of several layers of Kerto® LVL strips, and so it was one of the major challenges during development, to handle the large number of cutting files, 2,232 pieces, to be CNC milled and subsequently glued. The Kerto® LVL used is a sustainable building material from a solar-powered factory. The total construction is made of approx. 100m3 of wood, and according to the architect, this saves the atmosphere from 100 tons of CO2 compared to a similar building in concrete. 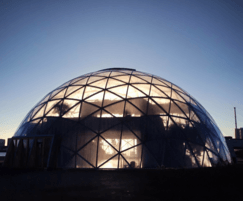 Coated with polycarbonate panels, the Kerto® LVL dome structure works as both a greenhouse and a weather screen for the inner house. The curved Kerto® LVL beams were prefabricated. This ensured a fast and efficient building process at the construction site as they were ready to install on site. 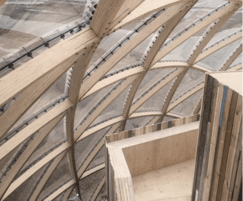 The finished dome is the result of a successful experiment with Kerto® LVL and gave Aarhus, as European Capital of Culture, a unique place for events in a spectacular wooden building. The building will undoubtedly provide inspiration for a future sustainable and climate-friendly timber constructions.